Ping Pong The Animation won the Animation of the Year award in the Television category for the Tokyo Anime Award Festival in 2015. Ping Pong The Animation is an exceptional show. This is less of a sports anime and more of a powerful emotions series. It's a beautifully crafted coming of age story and one that certainly doesn't come along often. In a word, it's unconventional. Nothing about Ping Pong feels ordinary so love it or hate it, it's hard to not recognize its artistic merit. The story is a simple one and it chronicles the lives of two boys and their experiences with table tennis. We're introduced to Makoto Tsukimoto, aptly nicknamed "Smile", and his boastful best friend Yutaka Hoshino, or "Peco". These two are polar opposites and we follow them through their high school ping pong careers. Their story is told in just 11 episodes and it's nothing short of pacing perfection. Everything meshes wonderfully from start to finish and each episode provides just the right amount of information without overwhelming or confusing the viewer. Ping Pong is great at giving you important plot points piece by piece and this makes it an incredibly engaging experience. Each episode is satisfying and this makes it very tempting to marathon. This is where things start to get shaky for the average anime viewer. The art style is simple and misshapen. There are no enormous and colorful eyes. The lines are crude and uneven so things like ping pong balls aren't perfect circles. It'd be no exaggeration to say this is some of the most unorthodox art in the industry today, but by no means is it bad. It may be out of the comfort zone, but it's fitting for what the show is trying to do and it has an inexplicable charm to it. The animation is quite weak at times and things just look sloppy. This actually works to the show's advantage by providing a unique style of its own. The art and animation stay consistent the whole way through. If this bothers you, get out while you still can. It's hard to believe a show about ping pong has music as good as this. The sound sets the mood perfectly. From simple melodic tunes while training to the adrenaline pumping opening song, Ping Pong knows just the right track to play at every given moment. A handful of tracks feel a bit out of place, but as a whole, it feels like watching one long movie. Additionally, the music is very good at distorting one's perception of time. There are times where it goes completely silent to emphasize the strain on a character. You may even associate certain songs with certain characters and this is a very good thing because it means you're connecting with them. Where Ping Pong really shines is its characters. The amount of development in such a short time is staggering. The interactions between characters are astoundingly genuine; every conversation feels natural. There's meaningful growth in even the most unlikely people and this is a breath of fresh air from shows where nothing seems to change. I don't want to go into too much detail regarding individuals, but the rivalries between characters are beautifully illustrated. Their personalities bounce off of each other in a frighteningly realistic way. The harsh reality of athletics is painted not only on their faces, but also on their words. A lot of conversations later on are poignant and almost poetic. It's tragic at times and these interactions do a great job of maintaining the morbid realism that made the early episodes special. Ping Pong is not a light watch. This is something that can be enjoyed by anyone who wants a good story. You don't have to like or even understand table tennis, it's first and foremost a tale about growing up. It's undoubtedly a memorable experience and something very much worth your time if you keep an open mind. It's a rarity nowadays to find many series or studios willing to take risks. Much of the anime industry has taken to fan-service oriented pandering and it's left me craving for something new. Something that can blow me away with it's creativity and unorthodox presentation. Utilizing its unconventional style, fantastic character development, symbolism, and occasional moments of witty dry humor, Ping Pong The Animation is that something. When I first started this series I had low expectations. How could a series about ping pong be any good? It seemed like the flop of the season. Fortunately, I have never been so wrong. Despite its appearances of being a simplistic show about playing table tennis, Ping Pong had a surprising amount of depth. Like any other sports anime, the series focuses on pushing the story forward by using the game as it's major plot device. However, unlike many other sports anime, Ping Pong takes a more believable, realistic style. There is no feeling of unrealistic, over-the-top antics like you might see in Prince of Tennis, nor is there an unbeatable Gary Stu like you'd see in One Outs. Ping Pong is simple, yet complicated. Messy, yet also clean. Realistic, yet unbelievable, all at the same time. Another thing the series does well is keeping the audience interested in the strategies, style, and skill that ping pong requires as a sport without seeming boring or tedious. In this series the games themselves also aren't simply just games. Each game portrays something akin to a soliloquy or inner monologue for at least one character. It props the characters up and pours color into their black and white hand-drawn cutouts. If you can feel the inner turmoil, anguish, happiness, and sadness just by watching two people hit a ball back and forth across a net on a small table, then you know you've watched something special. Of the few reasons people may dislike this series, the art and animation style will likely be the one. Ping Pong has a sort of rotoscope, flip-book type of style. At times it looks like a sketch or unfinished work, but it works so well for this series in particular. It's strange, but also charmingly unique. The games of table tennis seem so fluid and realistic that it sometimes feels like I might be watching people playing the game live right in front of me. It feels like a perfect match. Ping Pong delivers on the sound criteria just like any other. The beginning of the series didn't feel quite complete since it was missing its real opening, but the timing and placement of each sound felt spot on. It's easy to tell that the attention to detail is there. The opening will get you hyped for the episode and the ending will simmer you down. They compliment each other very well. The soundtrack, overall, is great. The two main characters of the series are Tsukimoto, "Smile" Makoto and Hoshino, "Peco" Yutaka. Despite being polar opposites, these two characters mesh together other with ease. Smile takes the role of the passive, quiet, and soft-spoken character, versus Peco, the energetic, loud, and cocky personality. They act as yin and yang in the series. While the main story is about these two, their friendship, rivalry, and camaraderie, it also takes the time to give the supporting characters their turn in the spotlight. All characters, whether it be the main or supporting, are dynamic and, as the series progresses, grow based on their experiences. Characters who come to realize their faults, and begin to instigate change to better themselves, are a rare occurrence in anime, yet Ping Pong is no stranger to utilizing the unordinary and implementing it with finesse. Although Ping Pong The Animation may be a more serious, somber sports series, it's easily a worthwhile watch for any audience. It's a shame that Ping Pong didn't quite get the attention it deserves. Despite being one of the most under-appreciated series from the Spring '14 season, it was truly a diamond in the rough. If you give it a bit of your time and a little polish I guarantee that it'll shine for you as it did for me. "Chant these words three times in your mind!" "Hero kenzan!" "Hero kenzan!" "Hero kenzan!" "Do that, and I'll come to you!" From time to time, a show will be despised by some for the unorthodox and uncommon mediums of presentation and execution. I hold the notion that Ping Pong The Animation truly uses its unorthodox way with great triumph and success. Ping Pong The Animation is set in a local Japanese town and portrays the lives of two young boys in the local table-tennis club. Having an innate talent for the sport, Makoto Tsukimoto, nicknamed Smile, and his close friend Yukata Hoshino, nicknamed Peco, are depicted as two ordinary Japanese males with hidden latent potential in the sport they play derived from their distinct and individual traits and personality. Both these characters have their own unique play style differing from another and is manifested clearly throughout the course of the show, whether they be panels popping up on the screen in sync with the sounds of the ping pong balls colliding with the table or the motion of their movements in matches. Both Smile and Peco have their own memorable characteristics and qualities. Smile is shown invariably depressed and has no interest in the sport itself whether it be for competitive of leisure play. Instead, his raison d'être for being in the club is to merely kill time in his depicted pathetic life. Be it the monologues of Smile to the stoic and emotionless quality of his, he is still shown as a likable character with genuine qualities. Despite hiding away his emotions, it is made evident towards the audience that he does in reality portray a sense of morality and his own set of beliefs and attitudes especially during and after the match against Wenge Kong, an extremely skilled foreign table-tennis player from China recently abandoned by his home team in China. Nicknamed China himself, Kong is another unique member of the cast in Ping Pong The Animation as it gives a national sense of diversity towards our main Japanese cast. Not only this, but we are also able to have an insight of players from foreign countries besides Japan as well as their individual used play styles and capabilities. Despite coming from China, the country where table tennis plays a fundamental role as one of the country's highly-acclaimed sports, Kong is not displayed as the archetype of overpowered-ness. Instead he is more or less portrayed as a tragic hero, as he comes to learn that there are many other great and exceptional players throughout the world and this adds on to his development as a character. Peco dreams to be a champion in the sport and is portrayed as an arrogant and talented player, as well as the epitome of liveliness as he is constantly engaged and is energetic in the sport he loves. He is almost portrayed as the antithesis foil of Smile as unlike Smile, Peco has a true passion towards table-tennis and tries his best. Other supporting characters worthy of mention would be the coach who constantly supports and drives Smile to play to his best knowing that he has a growing innate and hidden talent for table-tennis and will not realise it until he conquers some of his prime weaknesses, holding back against opponents and hindering the definition of true sportsmanship.Not only do these characters amaze me, but so do the support characters. Obaba, or the Tamura Lady is Peco's sensei from the table-tennis hall. As Peco repents and changes as a person who wants to regain his dream of becoming a ping-pong champion, both of them develop their relationships too and more memorably by the line of "love ya" till the point even Peco says it to Kazuma, also known as Dragon. Dragon, or Kazama is a well-known champion and paradigm of hard work and strength throughout the show. Represented by the mythical specie Dragon, Kazama portrays strong intellect and hard work with extreme effort devoted into table-tennis. Despite all of this has contributed into his overall power and making him stand as number one, he does not understand one thing about table-tennis. That one thing is having fun or just enjoyment in general, and because of this, he does not have the potential Peco has to become everything he wants to or can be. Akuma is another great side character who has underwent extreme change. After always tailing behind Peco in their childhood table-tennis life, Akuma finally regains more of what he wanted to be when he played against Peco. He acts as a symbol for hard work, while Peco at first is a symbol of talent, until Peco also attains hard work and having fun in the latter half of the anime as he understands that they are necessary components for success. KAs the anime progresses, all the characters, Smile, Peco, Kong, Kazama, and Akuma undergo heavy amounts of character development and mature as human beings, changing the way they act as well as their mindsets and just shows how much ping-pong as a sport can bring to anyone. Now regarding the art and animation, this is where critics place there hands on. Arguably having low budget visuals, many don't know that the manga's art is similar in its own essence and that the adaptation is attempting to be faithful to its source material. Taking this into consideration, the visuals can be seen as amazingly stunning and captivating to say the least. I think that this artwork is what brings the best execution from the show itself and using other high-budget and more modern and common forms of artwork would not bring out the same excellent effects this unique art offers. Backgrounds are detailed and facial expressions are clear most of the time. Specific camera angles and pop-up frames are used to their best extent during matches and the pop-up frames in sync with the music and the bounces of the balls all amalgamate to show synergy in its execution. This realistic approach from the art is what truly makes Ping Pong The Animation such a great success thus far. Getting used to the artwork is in fact not difficult at all, a few episodes and I'm almost entirely sure one can get used to it and understand its intrinsic beauty. The sound in the show is the paradigm of excellence. The opening song itself sets the stage for the incoming episode and circulates adrenaline around the viewer's body, wanting the music to last forever. The ending song closes each episode well, and leaves the watchers ready for the incoming previews as well as setting the scene by showing visuals of the town itself. The ost is phenomenal, it utilizes the rock genre to its pinnacle especially during the matches. Likewise, the ost also manages to regularly captivate the audience by matching with the animation during the games. Regarding the voice acting, a worthy mention is definitely Kong, or more known as China. The foreign voice actor is an aspect that also contributes into making China such a remarkable character as not only is it realistic, but not many anime you see nowadays utilize voice acting to the point where foreign voice actors are hired for the job. As the story progresses Peco's voice becomes a great voice to just hear into your ears. His enthusiasm and motivation and even his raison d'être is shown by his vehement voice actor and I am well sure that Peco and Smile's persona would be different without the utilisation of the same voice actors. Smile's voice does not change as the story progresses, but his tone does as he changes as a person. Ping Pong The Animation is definitely worth the watch as I enjoyed every minute of the show. The show utilizes innovative and unorthodox mediums and amalgamates the visuals, the sound, the story, as well as characters to their zenith. 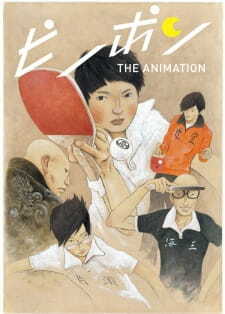 Give yourself the opportunity to engross yourself into the successful show Ping Pong The Animation is of today. There's nothing to lose and regret for watching it, but by not watching it, you lose the experience to touch upon this intriguing and exquisite show. Ping Pong The Animation has taught me many prominent values in life. Hard work....talent....and having fun.....these three constituents are all important ingredients that some people will always have more than others and no one can become the best player out there in the world with merely heavy amounts of hard work but having no fun at all. If you want to do well in something, you have to enjoy it. Don't envy those who significantly have more talent and power in them, strive for that power yourself by hard work and effort. But most importantly, remember to have fun and enjoy the time you spend in the sport. I recently reviewed something and gave it praise for the narrative it was able to achieve in 13 episodes. I can’t help but share that sentiment in regards to what Ping Pong is able to accomplish with its 11 episodes. A transformation story from angsty adolescence to enlightened and matured adults, Ping Pong goes well and truly beyond the generic confines of the sports genre illustrating a beautiful narrative of complex emotional growth and maturation, truly cementing its place as a modern classic. It wouldn’t be a stretch to call Masaaki Yuasa a genius. Those who have been exposed to his past works will understand that his left wing approach goes completely against the grain and standard expectations of animation by today's standard. Combined with the fact that his works are highly intelligent, often profound and filled with a philosophical depth Yuasa earns his place at the pinnacle of the industry. And here he is again. After Mind Game. After Tatami Galaxy. Yuasa has returned bellowing from above, telling us once again that life is simply worth living. That despite anything that happens in one's life, there is always a reason to push on. That in and of itself, is what Ping Pong is truly about. Living. Living life to its fullest, enjoying every twist and turn it brings. Understanding that, its no surprise that the characters, above all else, make Ping Pong truly special. They are the driving force of the series. Genuine, believable and one way or another it is likely for their emotions and struggles to resonate with the viewer. These character’s are not perfect, they are flawed, burdened and they struggle. The hero of the story - Peco - is so full of hot air and arrogance at the beginning that once he is brutally beaten by someone worlds ahead of him, and by someone he once thought was beneath him, he falters and loses hope almost giving up on the sport he has loved his entire life. Yet it is his inevitable acceptance and reinvention of himself that results in not only his transformation to maturity, but also the transformations of those he meets along the way. Similarly, Kong Wenge finds himself in a comparable position, being ostracized from the national Chinese team, he finds himself in egotistical ignorance like Peco, thinking he is above everyone else. It is only through his acceptance after playing with Peco that Kong evolves and is truly able to succeed. Kazama sacrifices everything in an attempt to maintain his family and club’s status. Ping Pong is simply a means to an end for Kazama. Through his match with Peco, he finally learns to let go of his burdens, to play for himself, no longer seeing the sport as a mandatory duty. Through exposure to the hero Kazama also transforms not only being able to enjoy the sport for what it is, but also his life. Yet no transformation is more rewarding or majestic than Smile’s. Peco finally breaks Smile’s robot shell in their final match and for the first time since he was a child, he smiles. Its understandable that the art deters individuals. By no means will everyone like it, it is far from mainstream but there is reason for everything that is drawn and animated. I am certainly bias when it comes to Yuasa’s art, it reminds me of older series, back when things were largely hand drawn, they felt genuine. Now everything seems cold and straight and lacking any warmth or sincerity. And for the majority that’s probably fine. That bias aside, I believe Yuasa’s eccentric art compliments the series brilliantly. The genuine art resonates with the genuine characters and their plethora of emotions and complications. A wide range of cinematography techniques and symbolism are used to emphasize the deeper aspects of the series. What makes Yuasa’s art truly special is they way he is able to use this symbolism to highlight certain aspects, such as the armor breaking away as Smile is playing against Peco in the finale, this signifies both visually and metaphorically that he truly has transformed. The artistic style is truly limitless in what it is able to illustrate, which is why I truly believe Yuasa’s art to not only be aesthetically beautiful, but also carry depth. Just like the art, Ushio’s OST is equally synergistic to the series. The score has a wide range of sounds and tracks that have a wide variety of applications for all emotional ranges and actions. Just like the art, there are many tracks on the OST that go beyond an enjoyable listening experience, which is to be expected when it comes to any high quality score. The “Hero Theme” is not only a phenomenal composition, but the use of it really exhumes raw emotion, it is engaging to listen to and it harmonizes well with what is transpiring. Smile’s “Monster” theme really reiterates the robotic personality he has. Ultimately, the OST has a brilliant atmosphere that only strengthens the series. Not only this but both the sound effects and editing are done phenomenally, nothing sounds out of place. Ping Pong reaches a standard very few anime will ever reach. Driven by flawless characterization, a beautiful story of growth, maturation and life itself is expertly illustrated. It is a series that certainly breaks the mould, avoiding the restrictions and cliches that run rampant through both the genre and animation in general. It is a story that’s message and characters are likely to resonate with the viewer, something only true art can accomplish. Ping Pong is Masaaki Yuasa at his best. Ping Pong is true art. Have you ever wanted to make anime in Japan? These six gaijin actually went ahead and actually managed to get jobs in Japan's animation industry. Some have thrived, others have suffered.